Egypt, Sudan and Ethiopia announced on Tuesday that they have "reached a consensus over the next steps" of the establishment of Ethiopia's controversial Renaissance Dam after 11 rounds of talks between the three countries. However, 2016 will still likely witness tensions between Cairo and Addis Ababa over the dam building process, which includes various key issues and details. The Ethiopian dam, which is being built on the River Nile, has been a top priority for Egypt's diplomatic agenda since the dam's building process started in April 2011. Egypt fears that the designated plan set for the establishment of the dam might affect its 55 cubic metre-share of Nile water, as Ethiopia's "long-awaited national project," which is scheduled to be completed in 2017, will be Africa's largest hydroelectric power plant with a storage capacity of 74 billion cubic metres of water. However, Ethiopia says that the dam will not cause harm to any Nile Basin country, saying that it is mainly aimed at generating power for a country where only 10 percent of the Ethiopian population have a consistent electricity service. 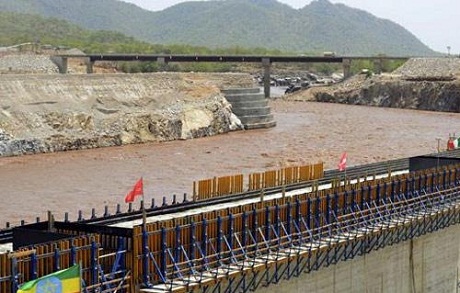 Egypt is negotiating with Ethiopia over two main issues: the timeline set by Ethiopia for filling the dam, as well as agreeing on an independent firm to conduct studies on the possible impact of the dam on the downriver countries of Egypt and Sudan. One of the two firms initially tasked with conducting the studies, the Dutch Deltares firm - assigned to 30 percent of the work, withdrew in September, saying that the current situation "did not guarantee independent and good quality studies." Ahram Online brings to you five key issues which continue to cause friction between Egypt and Ethiopia, which is expected to be a major diplomatic focus for Egypt in 2016. Egypt was guaranteed 55 million cubic metres of Nile water through the two agreements of 1929 and 1959. The 1929 deal involved an agreement between Egypt and Britain, the colonial power which was at the time representing three other Nile basin countries – Kenya, Uganda and Tanzania – that Egypt be guaranteed 48 billion cubic metres of Nile water. The 1959 accord between Egypt and Sudan increased Egypt's share to 55 billion cubic metres following the building of the High Dam in Upper Egypt's Aswan. However, in May 2010, five Nile basin countries – Uganda, Kenya, Tanzania, Ethiopia, and Rwanda – signed the Cooperative Framework Agreement of the Nile Basin Countries, dubbed the Entebbe Agreement, declaring the 1929 and 1959 agreements were "void and invalid because they were written and ratified under British colonialism." In 2011, Burundi became the sixth signatory to the Entebbe Agreement, followed by South Sudan in 2013. Egyptian officials rejected Entebbe, saying that both the 1929 and 1959 agreements stipulated that the approval of all Nile Basin states must be obtained before the implementation of any water-utilisation projects. Ayman Shabana, deputy director of the Sudanese Studies Centre at Cairo University, told Ahram Online that the Entebbe Agreement is Ethiopia's legal basis in building the Renaissance Dam. "Yes, Ethiopia is relying on the 2010 agreement, but at the end of the day Egypt's stance is more concrete and legal according to the 1929 and 1959 accords," Shabana said. "However, this does not mean that Egypt can necessarily use its legal rights in defending its Nile water share for two main reasons," he said. "The first reason is that resorting to international court is often politicised, and in this case I believe that Ethiopia is backed by influential powers." "The second reason is relevant to the March Declaration which was signed in Sudan in March 2015 by the tripartite countries, which does not stipulate that resorting to international courts is the solution for resolving any disputes between the three countries," he explained. The March Declaration, signed between Egypt's President Abdel-Fattah El-Sisi, Ethiopia's Prime Minster Hailemariam Desalegn and Sudan's President Omar Al-Bashir included 10 articles. It has been criticised by some experts who described it as loose and vague. Mohamed Nasr Allam, Egypt's former irrigation and water resources minster under Mubarak's regime, who witnessed the early chapters of the dispute between Cairo and Addis Ababa, told Ahram Online that the Egyptian government made a mistake by signing this deceleration in its current version. "This declaration was a carte blanche from Egyptians to the Ethiopians to build the dam while not guaranteeing Egypt's right to its share of water," Allam said. "The declaration accords give Ethiopia the right to use the dam's water in agriculture, which will definitely affect Egypt's share of water; Egypt also agreed to the storage capacity, which was a controversial decision," he added. Allam explained that the declaration does not specify a mechanism for resolving disagreements between the countries. "Ethiopia was smart enough to make good usage of time, as it was stalling in the negotiations and kept forcing Egypt to postpone the round talks till nearly 50 percent of the dam was constructed, with the first phase of filling possibly starting in mid-2016," he said. "Also bear in mind that all the evidence indicates that Sudan supports Ethiopia's position," Allam said. Earlier this month, Sudan's Al-Bashir told international media the Renaissance dam has become a reality which requires the cooperation of all parties to "ensure its success." Egypt's President El-Sisi sent a message to his Sudanese counterpart Al-Bashir through Egypt's foreign minister, Sameh Shoukry, before the beginning of the current round of talks, asserting that "the declaration of principles is the main basis for building trust and achieving common gains for the three countries." Both Allam and Shabana concur that Sudan is taking Ethiopia's side as the dam represents major potential for Sudan, even though it did not sign the Entebbe Agreement and recognises Egypt's share of Nile water. A 2014 study published in the independent Egyptian daily Al-Masry Al-Youm and conducted by Islam Mamdouh, an Egyptian dam expert and a PhD holder from Japan's Kyushu University, also suggested that Sudan will benefit from the Ethiopian dam. "The dam will prevent the yearly flooding of the Blue Nile, which often causes destruction in Sudan, and will also reserve water which would help in organising and facilitating the agricultural process in Sudanese land," Mamdouh wrote. "Ethiopia will only use 50 percent of the power generated from the dam and will offer Sudan 30 percent of the remaining power at lower than the international price," he added. No bright side for Egypt? Mamdouh's study suggests that Egypt could also benefit from the Ethiopian dam by buying the remaining 20 percent of generated power for cheap. However, Both Allam and Shabana do not see a benefit for Egypt from this project as it currently stands. "Ethiopia did not respect the March Declaration, which stipulates that agreement on the guidelines for construction and the first filling of the Dam should take place 15 months from the start of the conducting of studies by two international firms," Allam said. "Now the Dutch firm withdrew and the tripartite committee should choose a new one, but Ethiopia did not stop the building process and it will soon start the first filling of the dam, and that is the main danger for Egypt," he explained. Shabana said that the first filling of the dam will reserve the biggest amount of water compared to the following filling rounds, which means that Egypt might face a sudden shortage of water. "The option which the Egyptians have right now is to negotiate for prolonging the filling time for the dam from an average four to six years to a concrete six years, as well as reducing the dam's 74 million cubic metre storage capacity," Shabana said. Technical alternatives aside, Allam sees that if talks were to fail, Egypt could resort to international arbitration, but only after issuing an official statement declaring that Ethiopia breached the March Declaration. "But resorting to international court should happen alongside a political campaign so Egypt can put pressure on Ethiopia to stop constructing the dam temporally and take into consideration Egypt's reservations," Allam said. Mohamed Salman, a professor of politics at Cairo University, views the technical negotiations currently taking place as "a waste of time." "The dam issue should be solved politically, not technically," Salman said. "The March Declaration stipulates that when no agreement is reached, the presidents of Egypt, Sudan and Ethiopia should sit together and try to sort it out," he said. "So I think that Egypt should take it from there," Salman added. There is no transboundary or international law. There is one UN convention that says or talk about Equitable use, but it is not law and no one can force to do anything. That means Egypt will end with nothing at the end because it did not hold any of the given stake i.e Entebbe agreement which is the only option for Egypt. But Ethiopians may not even be interested on Entebbe agreement if they follow Egypt arrogance and if they wanted to deny Egypt everything. Your Cairo Schollars are misleading your politicians. I think they never read and learn? They only express their go or self serving opinions. Ethiopian can not be forced by anyone to fill the dam at un-necessary time schedule. The Dam is not being built to stand for many years without water and that does not make sense. The dam has to operate as soon as possible to pay the money used to build. Stop thinking only about yourself. If we have to think like you selfishly? No water could flow to Egypt. All you have to do is either to join Entebbe if Ethiopia is still willing to accept you or you take instruction from Ethiopia and obey because hold the key whether you like it or not. Even international arbitration, Ethiopia can refuse to go to any mediation because it can use the UN Charter of permanent Sovereign Natural Resources article that the water is its own God given Natural resources. In conclusion there is no any law that force Ethiopia to do what Egypt wishes Ethiopia to do. This is the naked truth about Blue Nile. No amount of lies, bias, self-serving opinion can change the fact that Ethiopia is sitting on the water, not Egypt. You people got it wrong all along. You will lose everything from the way I see it. Why? well, "Yes, Ethiopia is relying on the 2010 agreement, but at the end of the day Egypt's stance is more concrete and legal according to the 1929 and 1959 accords," Shabana said." This 1000 % wrong. Ethiopia is not part of this agreement because Ethiopia was not colony. Besides Ethiopia does not recognize 55.5 bcm. You fail 1000% on this by yourself. No one is going to force Ethiopia to be colonized in the 21 century if it is never colonized in the 19th century. You refused Entebbe agreement? Trust me, Ethiopia does not even need Entebbe agreement. The Entebbe agreement was designed to benefit all the 11 countries including Egypt, it is/was not designed to benefit Ethiopia because Ethiopia does not need all these because the water is in its own Sovereign Territorial Jurisdiction. The UN charter on permanent Sovereign natural resource allows Ethiopia even to use its water as much as it wants. The article mentions Sudan and Egypt will benefit by purchasing "Cheap" power from Ethiopia. As a country with one of the lowest per capita power consumption in Africa (less than 10% of Egypt's consumption) Ethiopia should increase its domestic power consumption first and sell any other residual power on as available and on non firm and "market based price"to Sudan and Egypt. I think Harmonious living between the people of Egypt and Ethiopia will solve some of the issues here. See, I am a Muslim brother practicing the religion in full outright. If I get married to a beautiful Egyptian wife, we will have a better relation and attachment leading to care and strengthened practice of my religion (caring for the Muslim brother/sister). The river Nile is one of the waters flowing from heaven to the earth, I have no doubt it is more than sufficient beyond the people living surrounding the river. Lets interlink and see the positive sides of connecting the people and caring more for each other. Love and Solidarity brings Harmony. I love Ethiopia, I love Egypt and I love the rest of humanity.